Now the Olympic Winter Games in Torino is over and we all go back to leading our normal lives. I have always liked the Olympic Games, the spirit and all the attention that surround them; from the opening ceremony through all the events till the very end. I think it breeds hope for a lot of people and unites them. For Sweden, this was the most successful Winter Olympics ever with 7 gold medals, two silver medals and 5 bronze medals, ending up as the sixth best nation in total in Turin. This was way over any Swede’s expectation and in the little betting pool we had at work, no one was even close when it came to the number of gold medals. 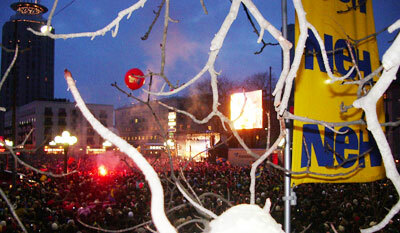 The thing that most of us Swedes hoped for and which also came true is the gold in Ice Hockey. 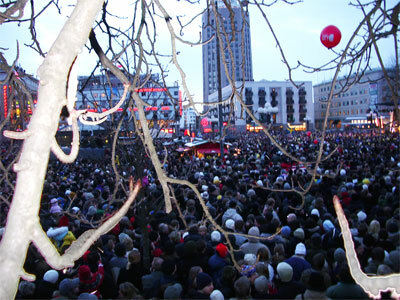 The team arrived home in Sweden yesterday afternoon and after going on a tour through Stockholm they arrived at a big square called Medborgarplatsen (translated: Citizen’s Square), where they were celebrated by around 30 000 people! I left work a little earlier to participate in the celebrations and when I and a colleague arrived there it was such a crowd that it was almost impossible to get anywhere. Frustrated with not seeing anything I decided to climb up a tree to getter a better view. Problem was, the lowest branches were fairly high up so I had to climb the first part of the tree by hugging the trunk and jerking myself upward. Once up, for the first time I realized how many people that had actually shown up; wherever I looked there were heads bobbing back and forth trying to get a view. Naturally, on the way up, I scraped my hands and legs from the trunk hugging so there were a number of places where small drops of blood surfaced. But hey, if they could win the gold, I sure could stand some pain climbing some sissy tree to get a better view. It was about -5 Celsius (that’s about 23 Fahrenheit) and the air density was rough and merciless. After changing position every five minutes, with the fear of falling down on all the people below, and occasionally getting my more delicate parts crushed against a certain rigid branch, the Ice Hockey team finally arrived thirty minutes later. Well, I saw them but I didn't meet them in person. However, when I was young(er) and playing ice hockey, we once had a practice with Mats Sundin. Congrats on the gold Sweden. As a Canadian I am still hurting at forgetting to send our players to the Olympics this year. I'm impressed that you went to take part of the celebrations.